MONROVIA – An Israelite philanthropic organization involved in rewarding citizens for developing their country by voluntary service has turned its attention to Liberia. The Chief Executive Office (CE0) of Good Deeds Day, Mr. Kaynan Rabino, told Liberian journalists in Monrovia, February 15, 2019, that his organization’s focus is on persons and institutions involved in voluntary services for the development of their country. “Giving rewards to citizens for their voluntary works for their country motivates them to do more for the nation,” Mr. Rabino said in an interview at his transit point in Sinkor, Monrovia, Liberia’s capital, on February 15, 2019. Education, health/sanitation and agriculture are some of the sectors under Good Deeds Day’s voluntary service reward, said Mr. Rabino, an Israelite. Founded in 2007, Good Deeds Day is now in 100 countries, and has a membership of three millions persons, up from 7,000 volunteers who started the organization, the CEO revealed. 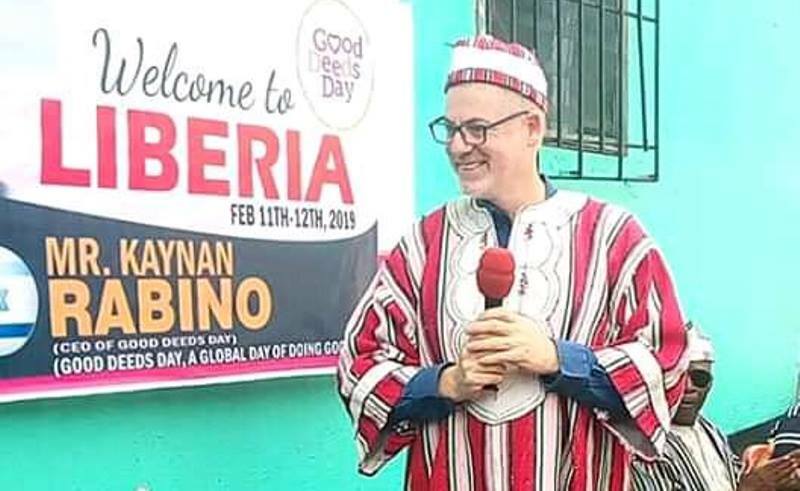 Responding to a question about reason for his organization’s connection with Liberia, Mr. Rabino said Good Deeds Day felt the need to reward the free voluntary services by Liberians, especially those whose patriotic services are ignored by leaders. He described Liberians as “hospitable”, during his response to a question about personal observation of Liberians’ common interaction with foreigners. On identifying Liberians who are worthy to receive Good Deeds Day’s ‘voluntary service award’, the organization will first do a nomination process through residents of communities, Mr. Rabino said. “The people living in the community know those who are passionately doing voluntary services in education, health or sanitation, agriculture, or another sector,” the Good Deeds Day’s CEO said, responding to a question about how his organization would know the opportunistic or eye-service volunteer from the passionate volunteer. Good Deeds Day was founded by a businesswoman and philanthropist called Sheri Harrison in Isreal, the organization’s Chief Executive Officer revealed. For its Liberia program, Good Deeds Day is working with a Liberian not-for-profit organization called African Upliftment, involved in community support through food, education, salvation, clothing, and healthcare. “African Upliftment is connected with Good Deeds Day, because both organizations share common vision,” Mr. Gaious Ben, Executive Director of African Upliftment, said to journalists. Introducing his organization’s guest earlier to journalists, Mr. Ben said the Good Deeds Day’s CEO was in Liberia to meet its Liberian partner (African Upliftment) and national leaders on how to go about its intervention project for Liberia, which will kick off soon. African Upliftment is serving Liberia through its FESCH (Food, Education, Salvation, Clothing, and Healthcare) project. Its Executive Director has been in the ‘voluntary service’ business from his ‘refugee life’ in Nigeria between 1994 and 2011, working through African Refugee Uplifment, a humanitarian service platform he dreamed about and started on Nigeria’s refugee camp in Ogun State and catered to the needs of Liberian refugees across Nigeria.